Nice upgrade man. I've been running leds for about 2 years now (started in my ram, then into my wj) I can honestly say I'll never go hid not with all the headaches they bring the can bus systems. That's a hell of a price, I paid 150 for my "cheap" set and over 250 for the ones in my ram. I didn't have any issues with the ones I swapped in my stock headlights, but those do look a wee bit thicker then the ones I have. Also I didn't see a ballast/controller of any sorts? Maybe that's why these are much larger then mine? Well, I know I haven't posted in a while, but I've been a Busy Bee! 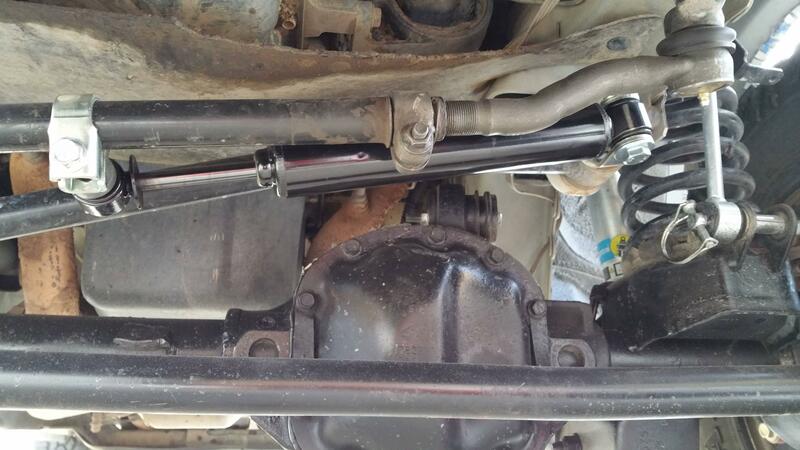 I began replacing Tie Rod Ends in late November, and finished all 4 up a couple of days ago. I used Moog Problem Solver Tie Rod Ends because I like being able to fill up joints with grease, and replacing contaminated grease after severe water or dust gets in them. 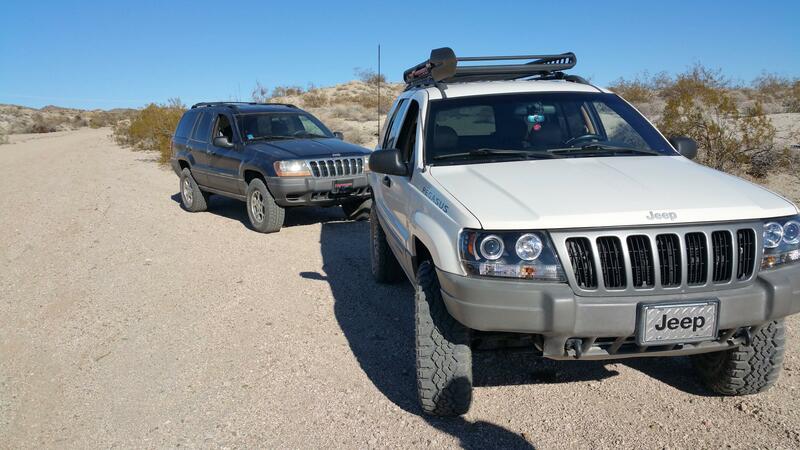 Also recently, I assisted Brady(a long time friend & brother) put his WJ on a 2" budget boost. Its amazing the difference those first 2 inches makes in ground clearance. I have a feeling his dub will get plenty of hand-me-downs from mine as I continue upgrading stuff. 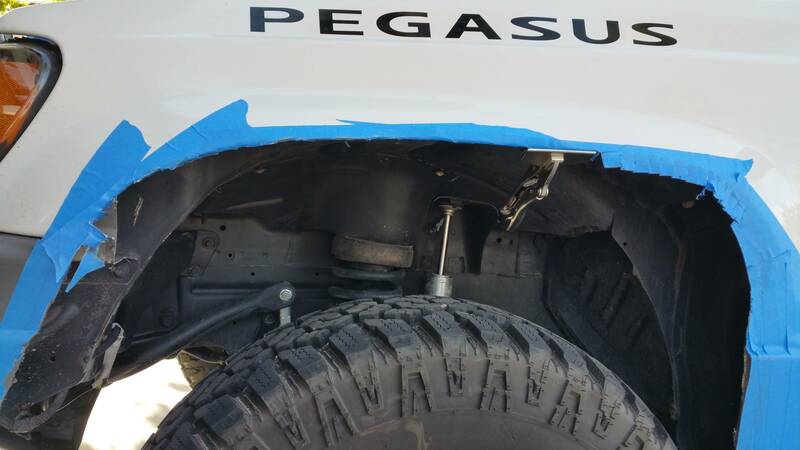 Meanwhile, on Pegasus, a few cool upgrades happened today. 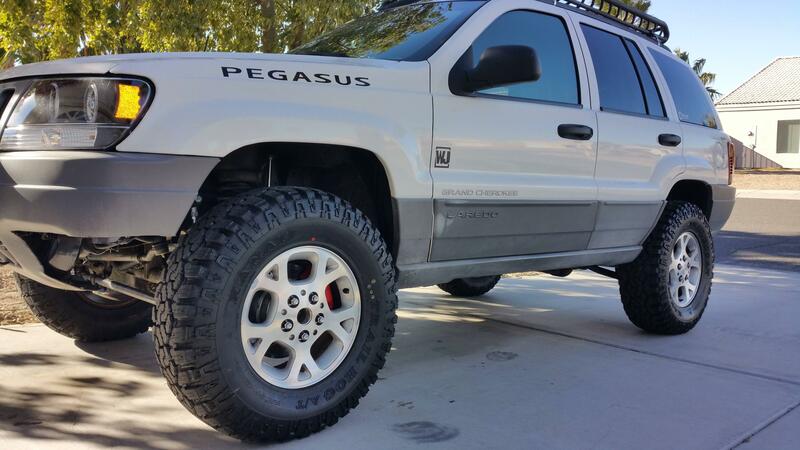 Firstly, I sold Brady my BFGs since his tires were bald, noisy, and overall pretty sketchy. They fit on his WJ very nicely. 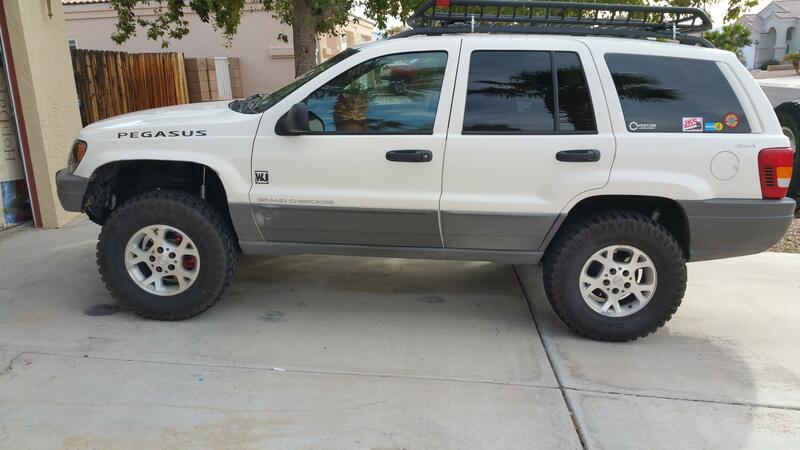 As for my jeep, We just swapped rims so he has the BFGs, and I had my new tires mounted up today. They are Kanati Trail Hogs. 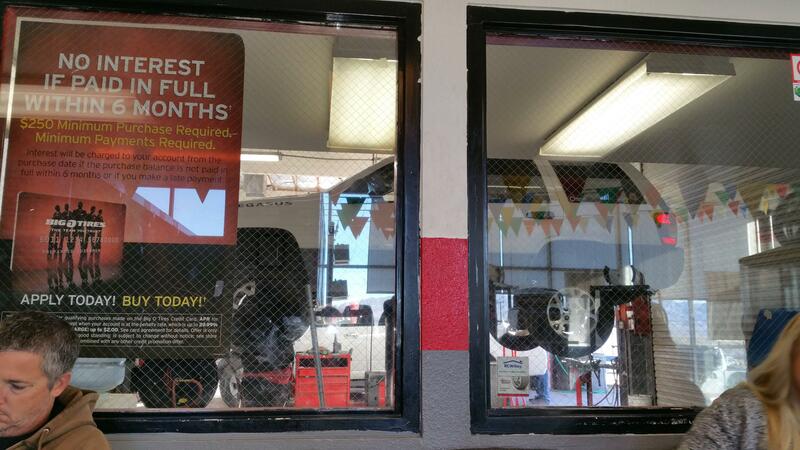 Kanati is owned by Greenball Tires, who are a reputable ATV & Dirtbike tire manufacturer. They started Kanati a few years ago as their "Extreme use division" The Trail Hog has a very strikingly similar-but-not-quite-the-same look to Goodyear's Wrangler Duratrac. 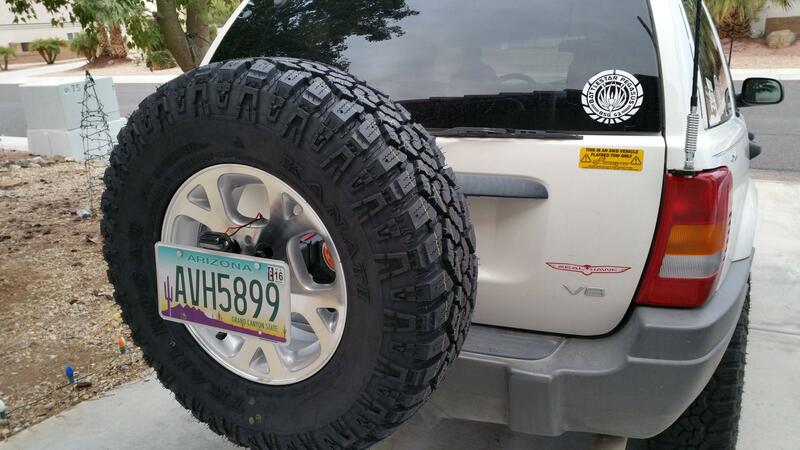 The Kanati Mud Hog also has a similar tread design to the Wrangler MT/R. So far I'm really impressed with the quality of these tires. Obviously they haven't been above 50 mph yet, but they don't howl at hwy speeds or below, so I'm impressed. the carcass is very very beefy. Very thick tire. I also jumped a size to 265/75/16, so we gained about an inch of tire/diff clearance. Impressive so far! Another thing I went out and bought was a set of Splined lugs, since I felt having a key to remove the lugs would be smart, as it makes it more difficult to steal the tires. They will look pretty nice once I paint the rims black sometime in the future. 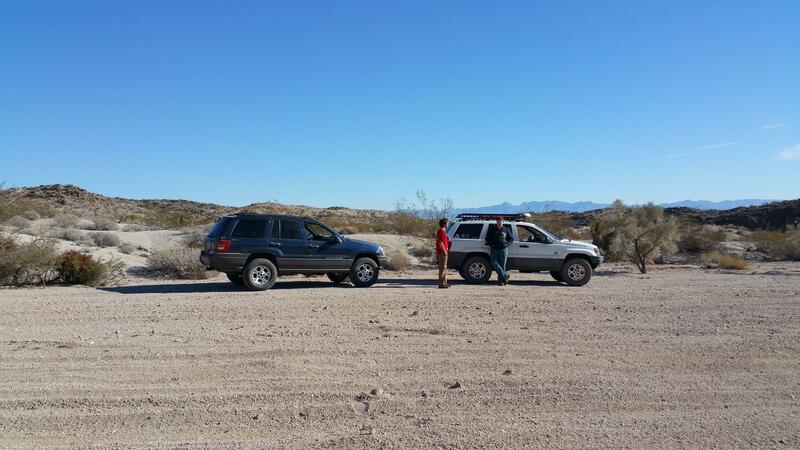 Yesterday we took both rigs down Christmas Tree Pass and back down the Mohave road from the highway to the colorado river. The 30.6" tires fit well on the 2" budget boost, although he needs spacers to allow for any sort of articulation. 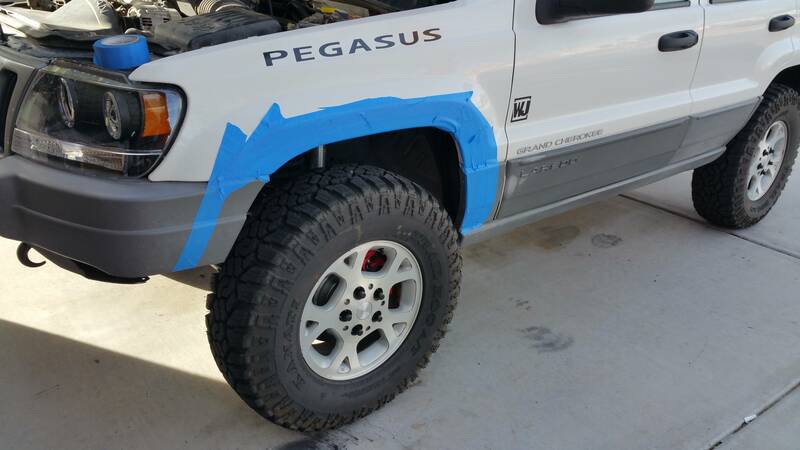 Pegasus did just fine, happily bouncing the new tires back and forth over bumps and ruts. The Kanati Trail Hogs are similar to Goodyear Wrangler Duratracs, but not quite the same. The Trail Hogs have a more aggressive tread, and the outer lugs are spread out a bit more. It doesn't seem to affect it on road, as they are very quiet and very gentle at 35 PSI. These bad boys have a very beefy sidewall, too. They don't wobble back and forth like the Rugged Terrains do, and they hold their lane pretty well; not much "walking" back and fourth, which is a pleasant surprise for something of this size and aggressiveness. They do rub on the back plastic "fender." I will probably trim and fold soon, though. The 30.6" Rugged Terrains squeezed nicely into the wheel wells, but the Trail hogs are a bit of a squeeze being so much larger and more aggressive. Well, I finally got all of the parts together to finally strap one of my christmas presents onto the Jeep. For Christmas, I got a Fabcore tire carrier. It mounts into the hitch receiver, and can drop down to give you access to your hatch. The problem with this design is that it blocks your license plate. Fortunately I found this JKS license plate relocation kit on Morris 4x4 for $45. This is a really great deal since it comes with all of its installation hardware and a light for the license plate. Most of the other relocation kits run $60 for the bracket or $99ish for the bracket with the light. I locked it into the receiver, but I also bought a 4-Flat trailer harness and wired the light into the brown and white wires. This way, If I ever need to remove the carrier, I just unplug it instead of having to un-splice it. My next project is figuring out how to relocate the washer fluid bottle. Since pre-2001 WJs have the... is it a vacuum canister? Up next to the brake booster and ABS module, that location doesn't work. I think I might try and re-work the air intake and go to a canister & cone type filter. Spectre and K&N both make a couple which may work. This way, I can mount a small washer fluid bottle in the space opened up on side of the engine bay next to the canister filter. It's an idea. We'll see. 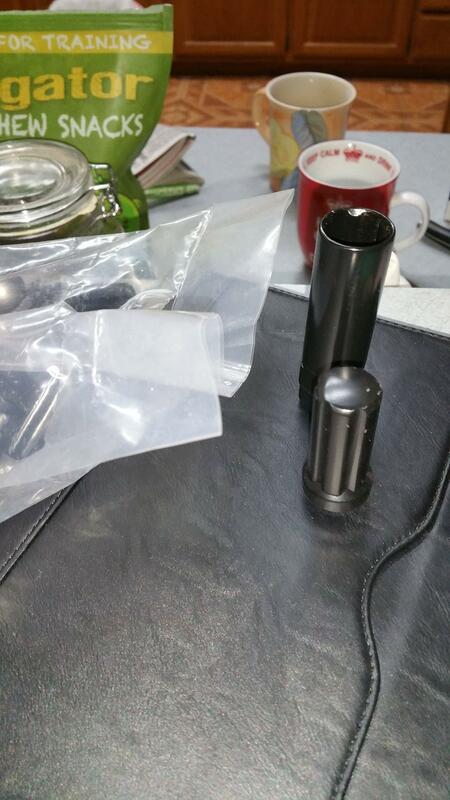 it's the charcoal canister for the evap system that is in your way on the early years. it's in the way of aftermarket rear bumpers instead for the later years! 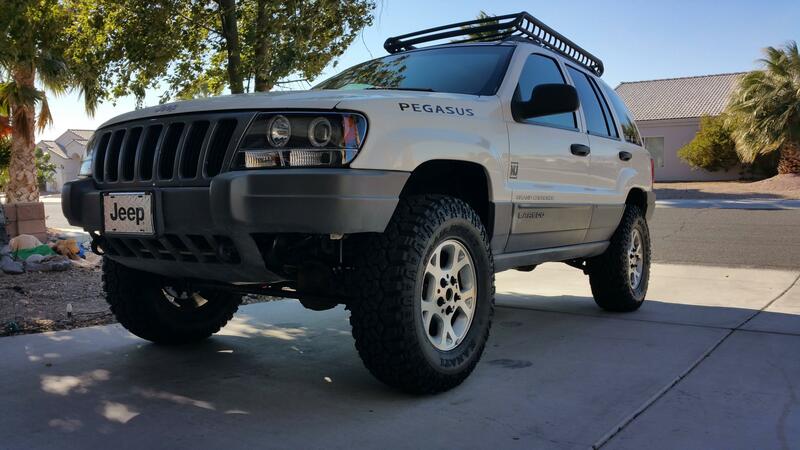 Your Jeep is looking great! Nice job on the build so far, very clean. That actually sounds... even less convenient than having it in the engine bay! Thanks! I try to make it as clean as possible. A lot of the other rigs that see the dirt in Ft. Mohave look junky and sort of... clobbered together (think MAD MAX). People take the easy way as far as modification, and don't really give a damn how it looks. I believe that everything has a place, and that both form and function should be respected when building a vehicle. Some of the most memorable vehicles I have seen are the ones which are thought out and built piece by piece, with reason. You know, like the rigs on here! So, an update to my canister filter idea... Spectre makes a canister filter which is 3" at both the inlet and outlet, which would be correct, But I'm still trying to figure out how to route it. Also, what to use as "plumbing." Spectre makes modular pieces that can be linked together to form a track, but they are expensive as S#!% and I'm not really sure if they are a 100% seal. Even though our super-digital engines aren't waterproof, I'd like it to be fairly dustproof. PVC is rather cheap, but looks pretty ghetto. The upside of course is that I can seal this better, and the plastic is somewhat more insulative than the cheap chromed aluminum the Spectre parts are made of. My eventual hope is to route this into a snorkel, to get the air intake point up and out of the high-density dust. Pretty much whenever I go anywhere and wheel, I have to replace my air filter and clean out the bottom of the air box. For the time being, the canister would be routed into the stock air shroud in the grille, but not having the air box would give me room for a washer fluid bottle. The upgrades keep on rollin' in! Recently I completely chopped off the original steering stabilizer mount because it had been dented sideways, sat (too far) crooked on the axle and the welded-on nut had been stripped out. On Wedensday, the IRO stabilizer kit arriver, and got strapped in. Interesting that it sits so differently than the KOR one. Meanwhile, today I began trimming and folding ops. Got the front done, Just have to finish the back tomorrow, and then paint the bare metal. I made most of the relief cuts fairly small. I took my time, and folded each bit in slowly and as precisely as the tools would allow. Here's how she sits for the night. Tomorrow I'll make another short run to Ace to get a couple more metal cutting wheels for the grinder, and some paint. It's a pretty huge difference between the untrimmed rear and the trimmed front.